The first edition of #ThursdayTalks for this year will be holding on January 31, 2019. This month edition would be exploring the role of the media in the upcoming election, with special focus on the subject of fake news. 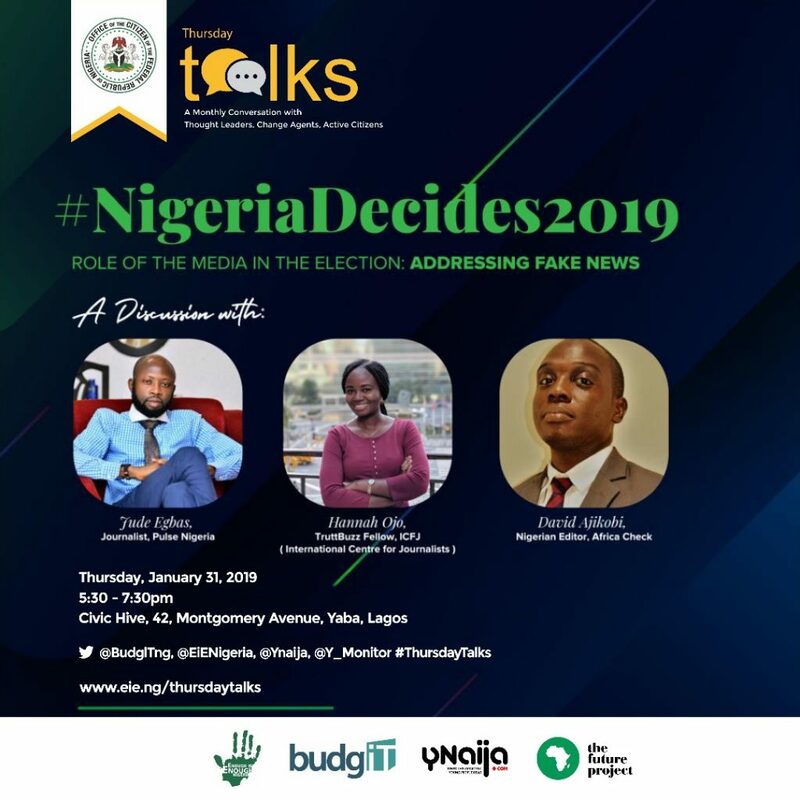 The topic is #NigeriaDecides2019, ‘Role of the media in the election: Addressing Fake News.’ The guest discussants are David Ajikobi, Nigeria Editor for Africa Check, Hannah Ojo, an Investigative Journalist with The Nation and TruttBuzz Fellow, (International Centre for Journalists) and Jude Egbas, Journalist with Pulse Nigeria. #ThursdayTalks is a monthly conversation with thought leaders, change agents, and active citizens. The program will hold between 5:30pm – 7:30pm at Civic Hive, 42, Montgomery Avenue, Yaba, Lagos. It promises to be engaging. Thursday talks is brought to you by Enough is Enough Nigeria, BudgiT, and The Future Project.